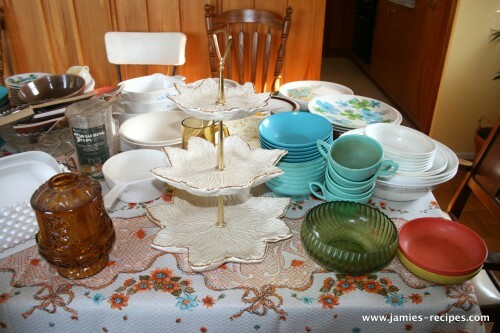 Today I did a little “thrifting” my neighbors down the street had several boxes and bags of stuff sitting on the curb. After seeing a car drive slowly past the junk pile and someone jump out to grab a mirror I was curious about, I had to walk down there myself and rummage. Boy am I glad I did. I scored! We asked the owners if we could take the stuff and they said absolutely. I actually made my husband get the car because there was so much cool stuff (for free might I add) that I new we couldn’t carry it all. I am actually tempted to go back and give it another once over just in case I miss something. If you know anything about any of the items pictured leave me a comment below. Please share your expertise with me! Check out the loot!Â Everything on the table, including the table cloth, is what we took home with us. I’m excited to get it cleaned up and sorted through. I will do my best to describe in the close up pictures what we found. 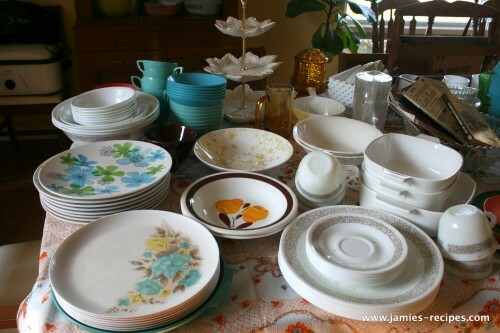 I scored two different Melamine sets of dishes. The bottom set is called Bouquet the top set called Fancy Free. I have (I believe) a full set of Corelle plates/dishes/cups/saucers/bowls plus 3 large bowls in the Woodland pattern (I think). 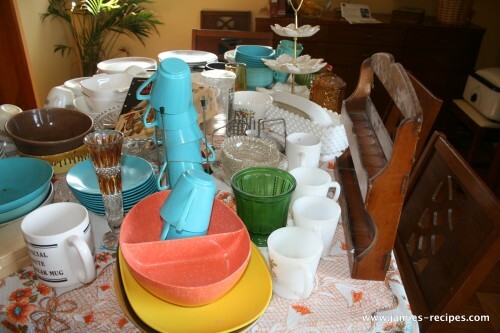 At the back of the photo are two different colors of blue Melamine bowls and some cups. Various other bowls and a set of three liquid measuring glasses. This photo is a little blurry sorry! 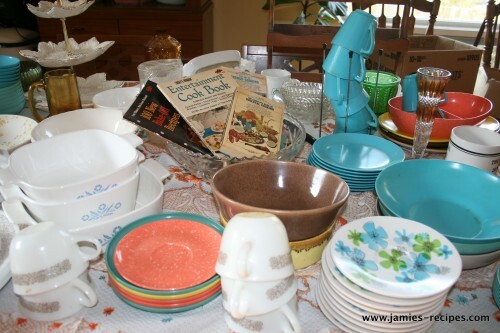 On the left are three different sizes of Corning Ware baking dishes (one lid included not pictured) in the Blue Corn Flower print (I think). Various vintage cookbooks from 1950s-1970s sitting in a cut glass bowl. 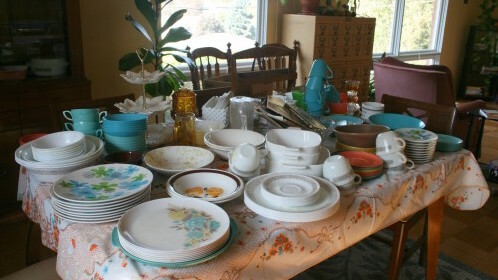 More Melamine and various other plates and bowls. On the left is a large coffee mug which I always need! Old potato mashers and a real biscuit cutter (yay!). A nice larger wooden spice rack that matches the small wooden one I have now. A neat amber colored glass candle holder pictured at the bottom left. A beautiful three tiered candy/appetizer dish thingy (there is no label on it). I love the green glass bowl on the bottom right side. p.s. I am working on a post about Penelope’s birthday and a recipe for her cake. So stay tuned!